Bitcoin sudden 400$ pump to 6800$ within minues! Was it due to Bitmex Downtime ? I am back today with another interesting and informative Crypto blog regarding Bitcoin recent 400$ pump today when Bitmex has gone for maintenance. This morning all of us saw a sudden run in the bitcoin price around 6:30 A.M. when the Bitmex exchange had gone for maintenance where mostly leverage trading happens.Before this Bitcoin was trading around 6440$ but a sudden climb is seen in the bitcoin price within few minutes and it is supposed due to whales manipulation right after bitmex downtime. IS BITMEX DOWNTIME AND BTC PUMP RELATED ? 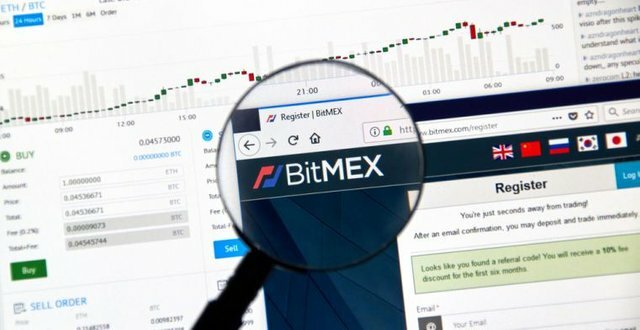 Bitcoin has recently showed 200-300$ pump in recent times but a hefty 400$+ pump within few minutes after Bitmex went offline is contradictory.Many of the experts are blaming bitmex for btc price manipulation.Bitmex is a platform where people do margin trading on bitcoin and some other coins.It is considered one the major reason for bitcoin price high volatility.Major whales place long and short order accordingly. SHORT SQUEEZE AND PROSHARES ETF SPECULATION ! A short squeeze is a rapid increase in the price of a stock that occurs when there is a lack of supply and an excess of demand for the stock.Short squeezes result when short sellers cover their positions on a stock, resulting in buying volume that drives the stock price up. This can occur if the price has risen to a point where short sellers must make margin calls, or more loosely if short sellers simply decide to cut their losses and get out. The short squeeze caused heavy losses to many short sellers within minutes due to btc pump. While Proshares ETF decision was to come on 23 August many investors were taking short positions because there were hardly any chances of this ETF approval.But things went opposite, Bitcoin took a sudden jump and all short sellers got REKT.This is pure manipulation, how can any government agency approve ETF in these conditions. Bitcoin market is really very manipulative due to bitmex.Next major bitcoin resistance is near 7100-7200$.It needs some serious volume to cross it or we can say another support testing of 6000-6200$.Let's see which side it moves. See you all in the next blog soon ! Don't forget to comment down your opinion below. Hahaha...may be it's because of Bitmex. Frankly speaking for me Bitmex is the place where gamblers meet other gamblers, kind of like a casino. Too much of anything is bad for our health, and the same applies to human greed as well. This crypto market is never gonna shoot up as all claims like in 2020 it will be worth $100,000...It's never gonna happen due to the whales ...the market is now under there control...Nothing is gonna happen good. For small investors like me it's not possible to take profits from such fake manipulating pumps...Bitcoin has become playing thing for leverage traders and big whales. @moneyguruu Nice content you have shared with us. Your study about crypto is fabulous. Sir, can we see dump when Bitmax will start? Since beginning I read many articles related to BitMEX and price manipulation.. but this BitMEX maintenance gives another chance to 🐋. See here 70% were thinking about the long leverage with 7200 support but 🐋 change it towards 6400..
And 70% investors gone with 7200 and they loss. Hi sir I like your all post .bitcoin jump next few day. Bitcoin is certainly being manipulated and due to overall decreased volume, bigger exchange downtimes increase the possibilty of manipulation. There was $120 million buy order on bitfinx and it certainly shot up the price. bro i follow you and realize how steem works i join steem 5 Days ago your post are really helpful.Your observation regarding bitcoins is really very good. thank you...! I think this is totally Scheduled pump by the wheals. Due to ETF news maximum of traders were taken short position because they were sure this ETF was not gonna be approved or this may be extended. Bitmax has already announced its scheduled maintenance. Whales took its advantage. As Bitmax is under maintenance and trader are not able to exit from there short position whales manipulate the market and create a pump and take huge profit. well came back sir.Again your making a good post and important information share us. I can follow you Youtube and also here steemit. Wow. Nice observations, hey guys I'm ICO reviewer can u guys please check my profile if you think my articles are good then you can upvote me. @moneyguruu sirji way bitcoin holding grounds around 6000$ and other alts are crushing slowly and slowly, I think massive rally is nearby. Hopes it comes soon enough. I just finished your total blog , total things described nicely. @moneyguruu sir you are great ..
@moneyguruu thank you first of all. I am seriously following you since last year. And I am too small to communicate but sir, by sending you this note I really hope my message will boost and you will notice me. And sorry sir frankly speaking I am not in support of leverage trading for the small investors, rather long term holdings are more safe. And ofcourse the formula of trading 3 time in an year is better option ( as per your traiding formula you share on YouTube). Thank you I. Steemit now I am 38 reputation, without investment. I have a Question. As we can see that your votes are very high but why your earning are very low. Besides we see that on another posts have very low votes but those earning are very high? So pleas sir tell me where is the problem?